Fayetteville, North Carolina’s population is 203,670 and the median household income is $43,882 which is less than the median US income. However, between 2015 and 2016 both of those statistics grew. The population increased by 0.57 percent and the household income by 0.58 percent. The per capita income statistics come in at $23,215, which is significantly lower than the national average of $50,392. The number of Fayetteville residents below the poverty line is 19.4 percent or just over 39,000 people. The largest industries in the Cumberland County city are healthcare and social assistance, retail, and educational services. However, the highest paying industries are the utilities, transportation and warehousing, and finance and insurance sectors. All told, the local economy employs 73,819 residents. Regardless of whether you work in one of the high paying industries mentioned above or whether you’re currently unemployed, it’s easy to get mired in debt. Many of your “All-America city” neighbors are in the same boat. For far too many Fayetteville residents, having significant credit card debt has simply become a day-to-day reality. Many consumers turn to their credit cards to pay for things, and it’s easy to see why. Beyond the convenience credit cards offer, many people use them to earn frequent flyer miles, get cash back, or other types of perks. All these reasons are sound—as long as you pay back the entire balance each month. If you only pay the minimum amount due, the debt will begin to grow and the more it grows, the harder it becomes to resolve. If you manage your finances by maintaining minimum credit card payments, you might assume that if you pay your bills on time, then you’ll be able to maintain a good credit score which will allow you to keep borrowing money. But this type of debt management can put you further at risk of getting into debt. You’re barely keeping up, and your credit score is suffering. If you’re experiencing any of these situations, help is available. Solutions to the problem do exist. Keep in mind, there may not be a single solution that works for you. Some people use a combination of debt solutions, while others try a few before landing on the right one. What matters is that you take the first step as soon as you can to put your debt behind you. Millions of consumers struggle with debt every day, and it can cause them a lot of stress. 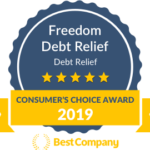 Freedom Debt Relief can help get you started on the right road to financial freedom. Call 800-910-0065 to speak with one of our Certified Debt Consultants. They can guide you toward the best solution, which can empower you to take control over your life and your finances. If you’re carrying debt, it’s possible to take care of it with debt relief solutions like debt consolidation so you can avoid having to resort to bankruptcy. Your ideal solution depends on the amount of debt you have, the kind of debt you have, and the time frame you hope to resolve it in. If you have more than $10,000 in debt, are willing to prolong your payment period, and want a simple monthly program payment, debt consolidation might be the solution for you. Fayetteville residents with severe debt could be eligible for secure loans from reputable lenders. Secure loans are obtained by putting up collateral, high-value assets like your home or car. The value of these assets is leveraged to get a loan with a reasonable interest rate. Of course, if you’re unable to pay back the loan, you run the risk of forfeiting your assets. But as long as you’re able to make your payments on time, there should be no issue. If you get a loan that’s not secured—meaning you’re not putting up any collateral—you’ll likely have to pay higher interest rates since the lender is taking more of a risk. But even with less favorable terms and higher interest, this may still be a better solution for you. Fayetteville residents can call Freedom Debt Relief at 800-910-0065 for a free debt evaluation to find a solution that is right for them. The Statute of Limitations limits the amount of time a creditor has to sue you for any debt you have not paid back. If you’ve heard about these statutes and wondered how they work, there are a few things to be aware of. It can be difficult to figure out if you’re responsible for paying your old debt because different rules apply depending on the type of debt, the state you live in, and the contract you signed. North Carolina’s Statute of Limitations for credit card debt is three years. Both written and verbal contracts are the same length of time. Three years is the shortest period in the nation—some states’ statutes take fifteen years to expire. But even if the Statute of Limitations has expired on your debt, it can still have an impact on your credit history, so it’s better to tackle your debt instead of waiting for it to expire. Don’t put it off any longer—several debt resolution plans are available. Get help figuring out which debt-clearing plan would work best for you. Call 800-910-0065 now for a free consultation.